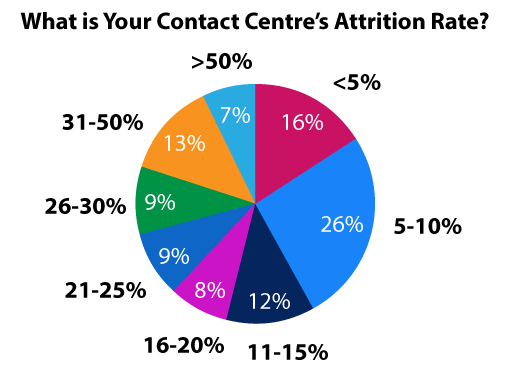 In this article we look at how to measure and calculate attrition rates in the contact centre. Attrition is the rate at which members of staff leave the workforce over a given period of time. It is also known as ‘employee turnover’, or ‘employee churn’, although in the contact centre industry, ‘churn’ tends to refer to the flow of customers rather than staff. Attrition is high in contact centres (particularly in the BPO sector) compared with other industries. A 2016 report by ContactBabel found that one in five UK contact centres have an attrition rate of over 30%. In addition, advisors seem to leave the industry after a very short period of time. In fact, some studies indicate that half of the advisors who leave the profession do so within their first 90 days of employment. The equation for attrition which is highlighted below often catches contact centre professionals out, although it seems relatively straightforward. The part that catches people out is that you must divide the number of employees that left by the ‘average number of employees for the period’ instead of the total number of employees for the period. The figure can be reached by taking the starting number of employees for the period, adding that to the finishing number of employees for the period, and dividing the result by two. For most, the period is a year. So, for a company that began a year with 6,500 employees and ended the year with 6,380 employees, the calculation for average employees would be (6,500+6,380) / 2 = 6,440. However, while the period is one year, it doesn’t mean that attrition rate is a metric that should be tracked only once a year. Instead, according to Dougie Cameron, Director of addzest consulting, it is better to calculate the metric on a rolling, week-by-week basis. It’s all about gaining actionable insight, and attrition rates can be really spiky. So, looking at weeks or even months in isolation may give you a false picture, while longer-term trends will give you much better insight. So, by measuring attrition on a weekly basis, you can immediately identify and address what caused a spike. If it was avoidable, the contact centre can learn directly from the experience, so it doesn’t happen again. What Is the Value of Calculating Attrition? The danger with attrition is that it becomes just another percentage that managers occasionally pass their eyes over. Yet, in terms of real value, high attrition represents huge costs to organisations. There are high costs in recruiting and training new staff; these are the direct costs of attrition. But that is not all. Dougie tells us that he did work in a contact centre dealing with customer subscriptions, and he found the consequential costs of attrition to be about ten times greater than their direct costs. If you value the costs of staff turnover, just look through recruitment costs, you’ll definitely be understating them. This helps when putting forward a business case for support in building a better contact centre culture, which, according to Dougie, is one of the keys to reducing attrition. The others, he believes, are workable shift patterns and flexibility in working hours. 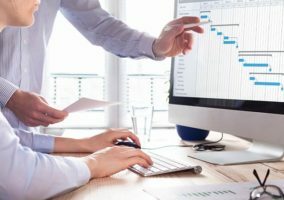 The first six weeks of an employee’s tenure is the most expensive, and an advisor will usually draw more value than they add for several months. However, the first six weeks is the period of time within which advisors are most likely to leave the contact centre. While this may give you some insight, you need to take a closer look at attrition rates in the first six weeks of the advisor “lifecycle”, to help identify the moment when advisors tend to leave. This will help you to identify where you need to improve the induction process. It’s important to understand each of the distinct stages of the early life cycle, not just the duration of the early life cycle – because you can draw the wrong conclusions from that. In addition, it can be good to measure advisor satisfaction when onboarding new staff. This can highlight what you are doing well, so you can then look to replicate this during other parts of the induction process. Another couple of ‘nuances’ of the attrition metric are voluntary and involuntary attrition rates. When advisors leave of their own accord, this is known as voluntary attrition. Alternatively, involuntary attrition – which is also known as intentional attrition or planned attrition – is where somebody is asked to leave the company. This is typically for performance-related (e.g. disciplinary) reasons and also due to redundancy. However, excluding involuntary attrition from the overall attrition figure is a practice that Dougie Cameron disagrees with. Failures that could lead to involuntary attrition are: recruitment failures, lack of adequate coaching and poor planning. So, it’s not a case that all voluntary attrition is bad and involuntary attrition is alright. It’s not a case that all voluntary attrition is bad and involuntary attrition is alright. Taking all of this into account, here are three mistakes that you should avoid when calculating attrition. Don’t present attrition rate as just a percentage to the wider business –The wider business will become much more interested in helping you to reduce attrition when you attach a cost to it. That’s not just recruitment and training costs, but other things like vacancy costs, the costs of the team spending time to help out new recruits, and so on. Don’t calculate attrition on a yearly basis – Only calculating attrition rates once a year will not provide you with insights as to what caused the attrition. Being able to look for spikes on a week-by-week basis will. Don’t separate involuntary attrition from overall attrition rates – Involuntary attrition may still be indicative of a business failure. Can you really leave it out of attrition rates when it’s a cost for the business and perhaps suggests a problem elsewhere? What Is the Key to Tackling Attrition? There are many things that contact centres can do to help reduce attrition. These include offering a clear pathway for progression, improving the work environment and, of course, increasing salaries. However, there are two other key factors that you need to get right in order to really reduce attrition: culture and shift patterns. To avoid either of these scenarios, you need to do more to build a positive culture, and you can start by getting the basics right. Talk to your frontline advisors and listen to their needs. Acting on advisor feedback and recognising their ideas, as well as their good work, is step one. This recognition is a key part of creating a good contact centre culture. For more on contact centre culture, visit: What Is the Best Model for Contact Centre Culture? In many contact centres, some shift patterns have higher attrition than others, according to Dougie Cameron. One solution would be that everyone has to do one Saturday evening every four weeks, and this seems a fair way to spread an unfavourable shift. However, this isn’t a system that is popular with everyone. Don’t recruit people who want to work weekdays to work on a Saturday night! Find people who want to work on a Saturday night and build a shift pattern around that, because they are much less likely to leave. Dougie’s comments highlight the importance of ensuring that advisors have a good work–life balance. This is because if work and life don’t fit together well, people will go somewhere where they can find a better match. Alternatively, the advisor may think that if they are going to have to work weekends, they might as well move on and gain an extra pound an hour somewhere else. While attrition may seem like a simple equation, it is easy to fall into traps, like only calculating the metric one year at a time. However, it is best to calculate overall attrition on a weekly basis, using a moving average. This will give you the most actionable results. Also, there are a number of nuances of attrition, like new-employee, voluntary and involuntary attrition, which can all be useful in the contact centre. Each of these needs to be measured in a way that provides insight as to why advisors are leaving, because the cost of losing an advisor is much greater than you might think, perhaps ten times greater.